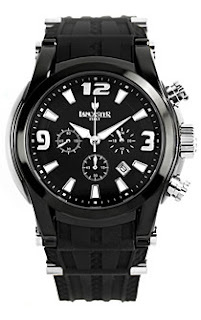 The Bongo Chronograph watch is from the Lancaster Watch Company. The Lancaster Watch Company was established in 1992, but went international in 1995. Four Swiss watch manufacturers make the watches for Lancaster. The watch below, reference 0548BKNRAR is a large watch. 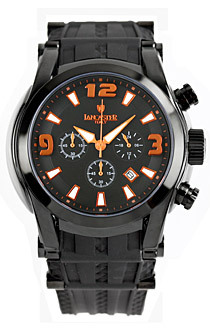 The watch offers the following functionality: hours, minutes, seconds, date (4:30 o'clock) and chronograph. The watch is available in IP Black coating, stainless steel or gold (PVD coating, I believe). 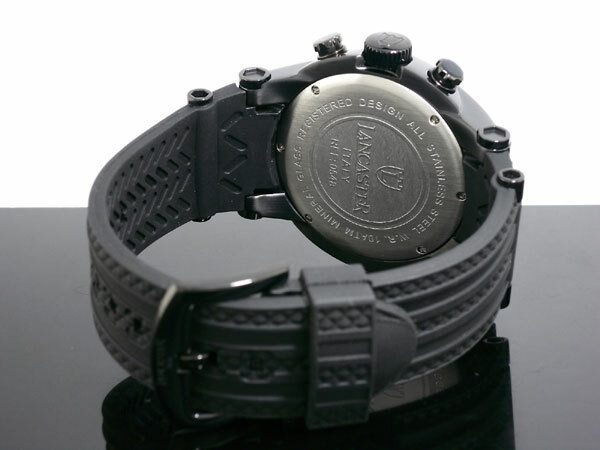 The watch comes in at 45 mm in diameter and it is 11.5 mm thick. The lug width measures 22 mm. The watch is fitted with a mineral crystal. All Bongos are issued with a rubber strap. The Bongo Chronograph is powered by a Miyota sourced caliber, reference OS20, which is a quartz movement. It has a water resistance rating of 10 ATM. The watch is expected to retail for about USD 490. A unique aspect of the watch is the raised Arabic hour index at the 12, 3 and 9 o'clock position. It is very thick and gives a 3D effect. Evidently this design is very popular in Japan. There are a number of other manufactures that are offering watches with the same design. The hour index and the hands are luminous. 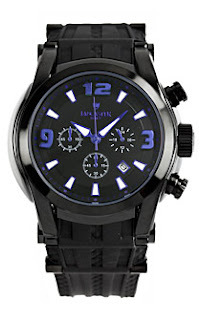 The watch is available in a number of colors for the hour markers, e.g. orange, red and blue. To digress, IP Coating stands for ion-plating coating. It is similar to PVD, Physical Vapour Deposition. It is the basic form of coating the case of a watch. Other methods include CVD, Chemical Vapour Deposition and DLC (some say the best) Diamond-like Coating.